Haruki Murakami. Counted among the world’s greatest living novelists. This warranted enough interest to immerse in his world to realize the magic. After going through the entire bibliography of his English translated books, I picked this one up hoping to further motivate myself to prepare to run a marathon. The person is Inspiring. After all the respect I had gained reading about his books and achievements, he left me awestruck when I discovered that he has completed an ultramarathon! 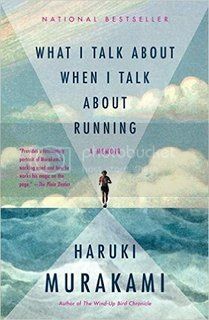 This book is like a memoir of the author’s running hobby (appears like a serious profession in the way it is done!) and his thoughts while running. The book is about the influence running has had on him as a person and thus on his writings. The book details out his preparation and his thoughts during various important runs of his life. I particularly like the parts of the book when the author talks about specific events, like the original marathon course in Greece or his preparation for the triathlon. Running and Writing, both require discipline and considerable amounts of self drive and motivation to keep one going. They are both lonely professions to talk about, and that is where personal reflections help the best. As individualistic pursuits, these pursuits allow you to have complete control to chart your own territory and define your own boundaries. As an aspiring marathoner, I could totally relate to the various experiences and the thoughts that have been detailed here. The author is a gifted writer is a known fact now globally. His sheer simplicity and the easy narrative wins hundred percent points. A must read for anyone with even a slight interest in Running or literature (The fact that you have reached reading till here indicated your interest! ), should read this book. Off I am, to get my hands on the remaining books by the author.